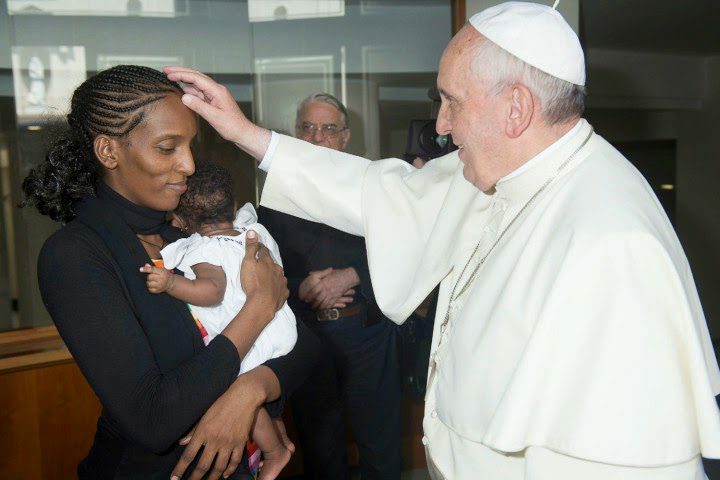 A Sudanese court sentenced Mariam Yehya Ibrahim to death because of her Christian faith, but now she?s arrived safely in Rome, where she had a private meeting with Pope Francis. The Vatican characterized the visit with Ibrahim, 27, her husband and their two small children as ?very affectionate.? The 30-minute encounter took place just hours after the family landed at Rome?s Ciampino airport, where they were greeted by Italian Prime Minister Matteo Renzi. She will remain in the European country ?for a short time? before she travels to the United States, the ministry added. ?Today we are very happy. ? Today is a day for celebration,? she said at the airport. Sudanese authorities had convicted Ibrahim of adultery and apostasy ? or abandoning her faith ? because she rejected Islam and married a Christian man. But those convictions were overturned last month on appeal, after the case gained widespread attention. It wasn?t easy for Ibrahim and her husband, American Daniel Wani, to leave the country. They were accused of falsifying travel documents and detained for two days at the airport in Sudan?s capital, Khartoum, as they tried to travel to the United States with their two children. Italy agreed to help the couple secure US passports for the trip after hearing her moving story, Deputy Minister of Foreign Affairs Lapo Pistelli said. At the Rome airport, Pistelli said the family was in ?excellent condition.? Ibrahim?s troubles started when one of her Muslim relatives filed a criminal complaint accusing her of marrying a Christian after she was missing for many years. Born to a Muslim father, she was still considered a Muslim by the Sudanese court ? even though she said she?s always identified as a Christian. Next articleSQueeze released brand new song ?Kolorbi?